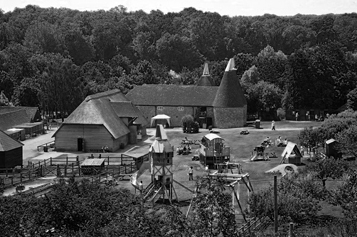 Kent Paranormal will be attending an event run by Trident Paranormal at The Museum Of Kent Life in Maidstone Kent on October 15th 2016.Dating back to 1555 and sitting on the site of Sanding Farm, Kent Life Museum is very, very haunted. As part of the Allington Castle it was once owned by Sir Thomas Wyatt, the lover of Anne Boleyn. Since then it has undergone many changes throughout its 400 years from Tudor through to Georgian and most recently Victorian, The last owner of the site being a Mr George Brundle. There are multiple buildings to explore here at this haunted museum with such a vast history of paranormal activity. These include a farmhouse, barns and an Oast House to name just a few. The stories related to the ghosts and spirits that haunt here are both tragic and sinister. There is an old gypsy caravan which sits in one of the barns which is said to be cursed and remains so to this day. The site itself sits at the bottom of Bluebell Hill which is said to be the most haunted hill in England. The ghosts and spirits include that of a German Fighter Pilot whose plane crashed on the site a woman who died holding her baby in her arms and a young woman who has been seen wandering around the pond near to the original Oast House. There have also been sinister shadows and faces at windows when there is nobody there. Lights flicker on and off and cold spots appear from nowhere. Copyright © 2019 kentparanormal.com. All Rights Reserved.